Caroline Gil here, Digital Project Archivist for the Leon-Levy Foundation-funded Legacy Digital Media Project at the Wildlife Conservation Society. My initial weeks here at the WCS Archives have consisted of inventorying, assessing, and developing an all-encompassing, forensically sound plan for imaging and conserving approximately 1,000 pieces of digital media. For this pilot project, WCS Processing Archivist Leilani Dawson selected pieces of removable media, including optical, magnetic and spinning disk hard drives, which encompass about 393 3.5” floppy disks, 390 pieces of either CDs and DVDs (in all their configurations, i.e. CD-R, CD-RW, DVD-R, DVD +R etc), 46 Mini-DV video tapes, and half a dozen external hard drives—really cool looking, heavy ones circa the early aughts. The pilot project is focused on digital storage media items that were accessioned with collections of primarily paper-based records that were created from the 1980’s to 2015 (bulk 1995-2010). During this time period, WCS departments relied on and produced an array of electronic records, including datasets, artwork, reports, video and still images. Some of the contents in the sample include early collected data, project reports, and promotional materials, like for example, from the Wildlife Health & Health Policy Field Vets program in the Ndoki National Park at the Republic of Congo, a project started out in 1993 and recently featured in a New Yorker article about elephant poaching. Others include GIS databases of conservation work undertaken at Glover’s Reef, Belize, Maya Forest, the Mesoamerican Biological Corridor, and the Mayan Biosphere Reserve. Most of the media contained in the sample are considered “legacy” formats, due to the fact that their associated file format, file system, hardware and/or media carrier has been deemed obsolete. In his book The Language of New Media, media theorist Lev Manovich delineated the principles of new media into 5 categories: numerical representation, modularity, automation, variability, and cultural transcoding. In doing so, he laid out a foundation towards a basic approach for preserving old media formats. In plain terms, one must transfer all of the content from its out-of-date carrier onto a “managed” and contemporaneous storage system, while retaining the original media carrier. This means an archivist must consider a range of factors, components, and workflows catered strategically to the media formats available and the hardware capabilities that are within the reach of WCS. The final objective is to create a bit-by-bit copy of the storage media, with the goal to preserve not only the individual files, but also how they were organized, time-stamps, technical dependencies and any additional metadata. Nowadays, most people remember their first desktop computer with a uncanny mixture of nostalgia and dread. One of the most recurring media formats in the sample are 3.5” High Density Floppy Disks. With digital media, as media theorist Jussi Parikka says, “storage never just is.” Parikka expands by adding that storage media “…moves, is intensively reworked continuously and enjoys a temporal duration technically known as hysteresis while being packed in a very material substrate”. But what and how is exactly arranged in these mysterious magnetic-coated substrates? I’ll attempt to illustrate in the simplest of terms, how the most common storage medium of the 1980’s, the 3.5” floppy disk, works. 3.5” Floppy Disks were hugely popular during the 1980s-1990s, and were initially devised as a storage medium for early PCs that lacked internal memory power. Magnetic storage media has been in development since the late 1960s. The first type of floppy disks used were 8-inch “diskettes” that later advanced into 5.25” floppies, which were used with the first IBM personal computer in 1981, and later refined into the 3.5” floppy disk. The floppy disk’s primary use was to transfer data, to back up other media, and to facilitate the installation of software. A team of engineers working with Alan Shugart invented floppy disk technology, which would go on to be perfected and worked upon by Memorex, IBM, and Shugart’s own company, Shugart Associates (later rebranded as Seagate Technology). Floppies consisted of a rounded disk media with a protective square casing, often referred to as a “jacket”, and in its initial period made of pliable plastic (hence the name ‘floppy disk’). At the center of a floppy disk, covered by a small metal disk, there would be a small gap that would expose the internal magnetic media to a “read/write” head on a driver, that would interpret the data. The donut hole would also act as a grasping mechanism that would enable the interior disk media to spin. Write protection could be actuated on 3.5” floppies by engaging a slidable piece of plastic, on the right-hand side of the back of a disk. Floppies commonly used a FAT12 (File Allocation Table) file system. 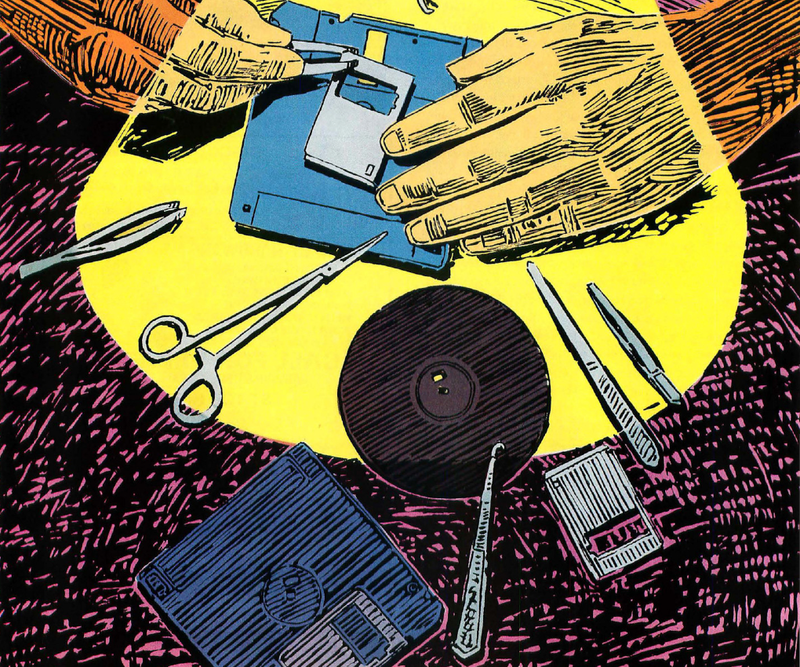 Tracks within a floppy are arranged concentrically, as a consequence, the read/write heads could jump from file to file, without having to elapse through an entire track in sequential order. This was a huge advantage at the time, that allowed for faster retrieval of data. Living inside these tracks are little angular blocks called sectors. For 3.5” HD floppies, 512 bytes are earmarked per sector, there are 18 sectors per track, 80 tracks per side for two sides, which totals to 1,474,560 bytes per disk. 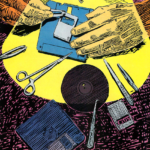 Its small storage size, susceptibility to accidental deletion, and a life span of less than 5 years diminished the popularity of the floppy disk. By 1998 Apple introduced the iMac personal computer model, which did not feature a floppy disk drive, Dell computers followed in 2003. With the broad availability of more sophisticated storage technology, the end for the floppy disk had finally reached its course. As part of this project, WCS Archives acquired a Forensic Recovery of Evidence Device, better known as a F.R.E.D., a forensic workstation that will enable the archive to make disk images—bitstream copies of the data contained in the original legacy storage, including 3.5 floppy disks! Digital forensics refer to “discovering, authenticating and analyzing data in digital formats.” It is a field and practice that originates from the law enforcement and military intelligence factions of government, and its tools and methodologies have cross-pollinated onto the archives and cultural heritage stratum. Notable cases of digital forensics at work in law enforcement include the capture and prosecution of the B.T.K. Killer. 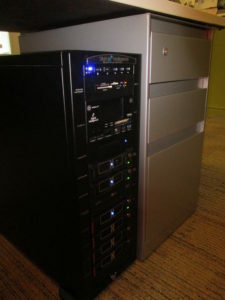 In the cultural heritage sector notable examples include NYPL’s processing of Timothy Leary’s papers, which included his complex psychedelic video games, and the Salman Rushdie archive at Emory University’s Manuscript Archives and Rare Book Library (MARBL), which includes three personal computers, circa 1990s, and a handful of hard drives. Thus, lo and behold! Meet our new friend, FRED! Gathering knowledge about the history of media formats in your collection and how they have been utilized in wildlife conservation programs can shed light as to how to analyze and contextualize the data contained therein. As for now, we are approaching a stage where we are setting up our born-digital processing toolkit. We plan on using BitCurator, a suite of open-source tools developed to extract, analyze, and produce reports for born-digital objects in collecting institutions.